Kathrin M. Wyss’s debut book, “Dare to Trust: Spirits at Work” (published by Balboa Press), offers a compelling mix of biographical spotlights focusing on spiritual discovery, spiritual growth and channeled messages from spirits where practical living can merge with spiritual awareness. 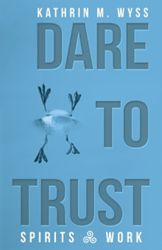 The title summarizes the concept – “Dare to Trust” – to trust that there is a layer in the world and in the universe, that isn’t visible, yet filled with supporting entities such as guiding spirits. Wyss’s book also offers self-revelations and an acknowledgment of the challenges and joys of opening oneself up to spiritual growth and non-ordinary realities. The book intimately documents Wyss’s leap of faith as guiding principle in life. Growing up in Switzerland, Kathrin M. Wyss felt early on the deep connection with nature and people’s health. She decided at age of 10 to study pharmaceutical science and started a successful career in the pharmaceutical industry. She completed her education with several degrees in marketing, yet felt that something deep within her was missing. At the age of 35 she faced some health issues and decided to seize her path to reassess life, which ultimately led to a major spiritual awakening. She moved to Santa Fe, New Mexico and started a formal shamanic training. Wyss acts as trainer and coach to bridge the spiritual and the corporate world. More information is available at http://www.bizshaman.com and http://www.beachtig.com.